Sailing is a great sport and for almost 20 years I also worked hard at making it a business. That's over and my beautiful boat is sold. But the memories remain and I have captured some of them here. I have also done this because I still get lots of questions about my MAC65, a Macgregor65 that I extended to 70 feet. If you want to go directly to exterior pictures click here. 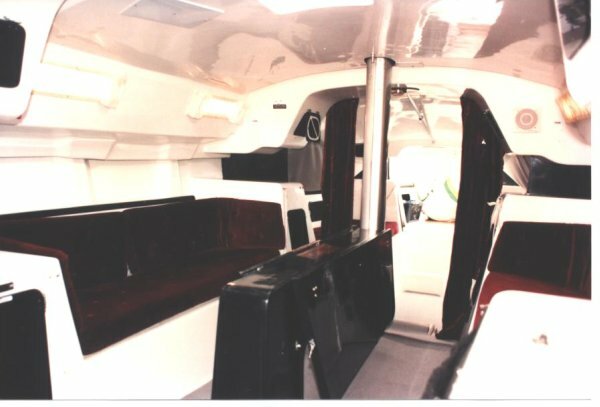 The stock interior was entirely fiberglass with white gelcoat and grey non-skid soles. Most of this is also structural so, of course, I did not alter it as I made the boat more attractive to the charter trade. 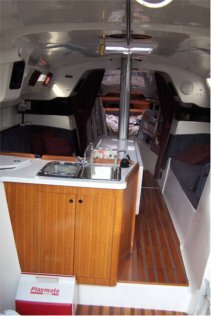 All the wood, predominantly teak, I added as I converted her from a racer to a very fast cruiser. I love the statement that I think was coined by Bill Lee, who built the beautiful Santa Cruz line of Ultra Light Displacement Boats (ULDB)FAST IS FUN. The MAC65 racing version is an early ULDB, designed by Roger MacGregor of MacGregor Yachts. He built a series of them in the 1980's and they set a number of records. The racing series boats were fitted with enough foam to make them unsinkable - the best lifeboat is your own boat. Pundits joked that he did this because he scrimped on construction. In my view, based on my own experience sailing on 3 different racing version MAC65 and sailing my own from Victoria BC to Maui, these are strong safe boats that reach speeds up to 25 knots. I have singlehanded my own boat and in one 3 hour period on a beam reach in 25 knots of wind I covered 51 nautical miles. 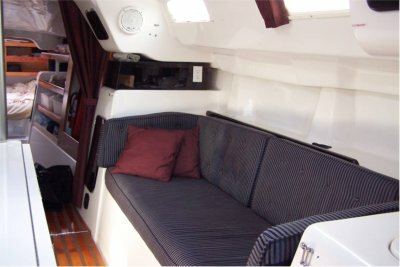 Looking forward from companionway. Table and center-line double sinks have been added to the stock Big Mac. 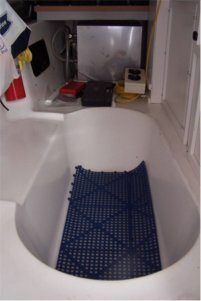 Old sink space converted to storage – note partially open white top. 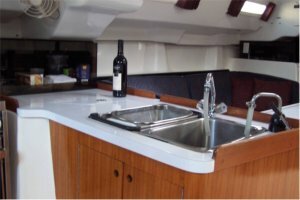 Looking forward from companionway – another view of sink. Table leafs fold up to seat 8. Starboard leaf folds all the way up to reveal 2 separate storage each with 2 shelves, and separate doors. 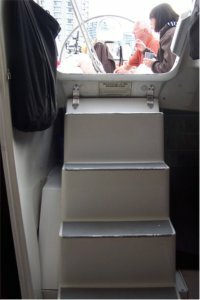 Companionway – stairs lift for access to 4 – 6 volt traction batteries hooked in series to create large 12 volt bank. White box under stairs is engine cover. Engine is a Pathfiner 85, basically a marinized VW/Audi 6 cylinder diesel with 85 real horsepower – drives the boat at 10 knots burning less than 3 gph. 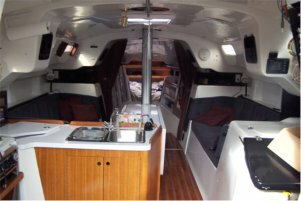 On starboard of companionway is the heads with full bathtub. Stainless steel hot water tank in background with tool box shelving above. You can also see the remote controls for the 12 volt main halyard winch. This is stored below until needed – the wiring is long enough to be able to walk forward on deck to amidships with it. Toilet/head as seen from bathtub. Medicine chest over head and other storage outboard. Heads face aft as is proper in a sailboat and you are well braced to port and starboard when seated on it. Quarterberth cabin is to port (opposite heads). Fits a couple. Note light weight drawers. These have never opened or shifted underway. Seat in quarterberth cabin with cabinet behind. 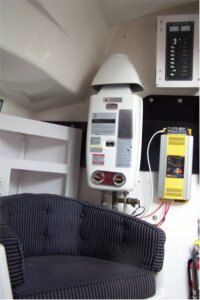 On-demand hot water heater and high end Xantrex 20 AMP battery charger. The seat is somewhat wasted but it is part of the structural liner which is glassed to the hull. You also see the 110 shore power breakers. 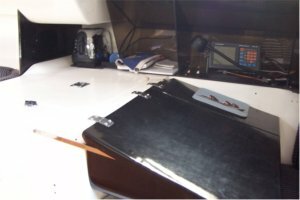 I installed 1 shore power plug in each of quarter cabin, heads, nav station; and two in each of galley, salon and V-berth. Ahead of the quarterberth cabin on the port side is the galley. Black bag contains numerous pockets for storage of utensils and silverware. The gimballed CNG stove is great. In harbour I used a 2 burner shore power hotplate, which of course reduces your use of gas. CNG, being lighter than air is great in a boat. Unfortunately it is not available everywhere. For example we only found one outlet in Hawaii – maybe there are more now. Note black canvass, double-stitched bags for utensils. There is a lot of storage space to left (aft) of stove. Forward part of galley. 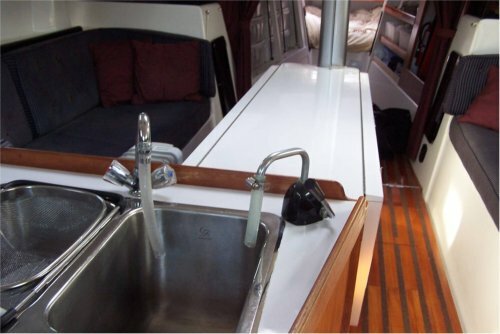 The double stainless sinks on centerline were added by me. The original sink has been converted to storage and additional storage (lexan cabinet) added outboard. 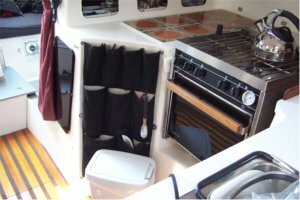 The galley plan allows for a sturdy safety belt with several attachment points so that the cook can be hooked in at different points, thus avoiding being right in front of the stive when this is not needed. The two wings of the table lift to seat up to 8 people comfortably. Under the table are double shelves for a lot of storage. The space is large enough that it is divided in half with one vertical bulkhead at its midpoint. We use the forward half for pots and pans and the aft half for dishes, glasses etc. NAV station is to starboard opposite galley. Just forward of the nav table is the top loading refrigerator/freezer with new plates and new condensor. Instruments are housed in a lexan cabinet to protect from any damage. Aft side of nav station.12 volt breakers in 3 separate panels. 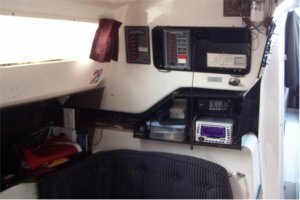 Again I fitted lexan cabinets to protect the radios - VHF, Enetrtainment Center - and the SSB from any drips, physical damage. Starboard settee in salon. You can see the attachment points for lee cloths. Port settee is identical. Note added lexan cabinet that houses one shore power outlet. This held our DVD player. Port side of salon is identical except that the table is closer to the settee and the hinged tabletop is correspondingly narrower. Tabs were placed on the side of the table cabinet at same height as settee so that a hinged piece of ply on top of the settee could swing over making the entire space into a queen berth. Immediately forward of the salon were two berths. These have been converted for stowage. To port are these light weight drawers with sufficient air circulation to help with prevention of mould. Above them is a large (full-length) shelf that allow for storage of lots of stuff. 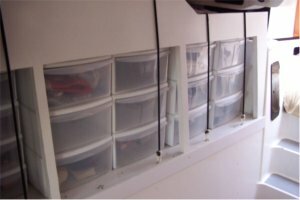 The bungee cord is an inexpensive yet elegant way to hold the drawers in place, and are easily removed in harbour. Underway the bungee cord can be pulled out enough under tension to allow access to each drawer. 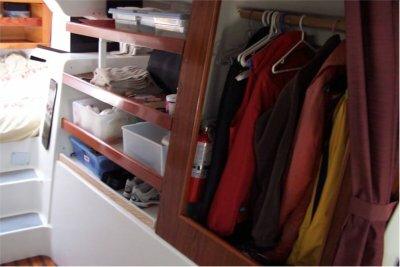 The second berth- to starboard – is now an open hanging locker and open shelves with retaining edges. They can be used with or without bins. Being open they allow for lots of air circulation - and therefore no mould. 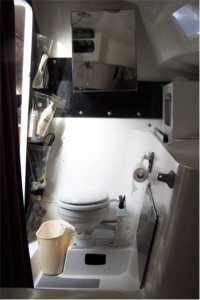 The void under these former berths, under the quarterberth, the V Berth, the transom and part of the forepeak locker are all stuffed with foam for flotation. In addition each of these forms part of the boat's structure. This shot shows both sides and the sole. Extra anchors are stored under the raised portion. 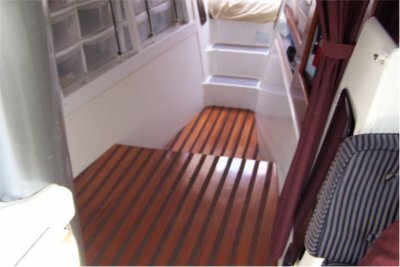 Forward you see the steps to the V-berth (formerly the sail locker). 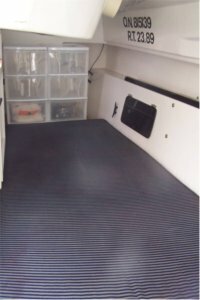 The V-berth (formerly the sail locker) is huge, has a large Lewmar Ocean hatch over it. The hatch has bug screen and blackout screen, as does the smaller Lewmar hatch in the salon. 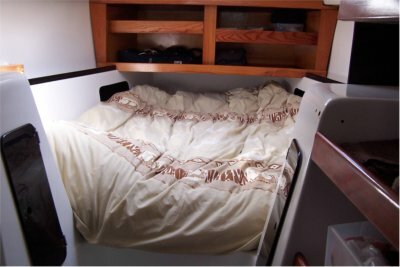 The cupboards over the foot of the V-berth are very useful and will hold fairly large objects. Nothing has ever fallen or been ejected from these cupboards. For exterior pics click here.